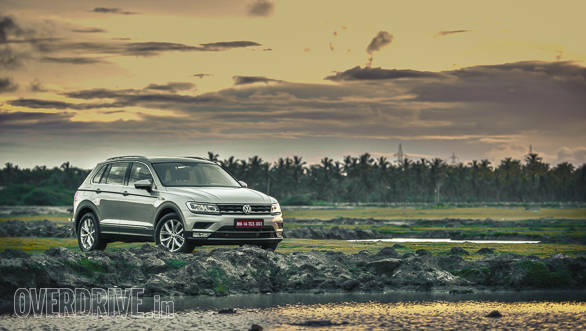 Volkswagen has finally brought the much-anticipated Tiguan SUV to India. A popular SUV that sold around 3.5 million units internationally since its launch in 2007, the Tiguan is an important offering for Volkswagen for multiple reasons. 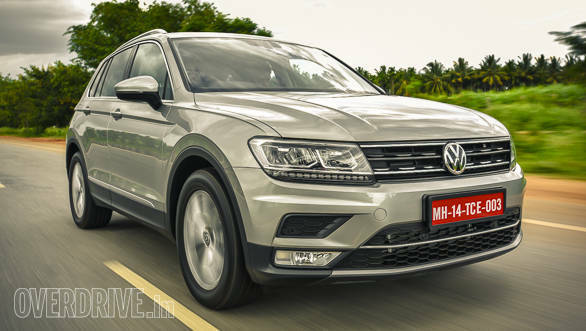 Firstly, it debuts the MQB platform for a VW product in India. Secondly, Volkswagen is entering the compact luxury SUV segment for the first time. Does it make the cut? To begin with, the 2017 Volkswagen Tiguan is a smart-looking SUV. It bears no resemblance to its predecessor and that is a good thing. While other SUVs in this price bracket choose to look overtly massive and bulky, the Tiguan has a sophisticated design that leaves a positive impact. 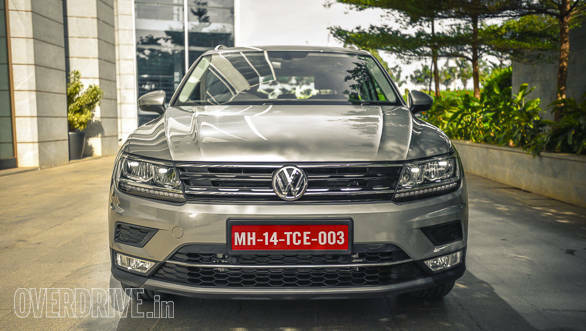 The face of the Tiguan is similar to the new-gen Passat sedan, and Volkswagen has used chrome very tastefully on the slats of the radiator grille as well on the air dam of the front bumper. The bonnet, meanwhile, sports characteristic lines that join the grille in a V shape. Giving the front a wider stance are the sleek LED headlights that merge neatly with the grille. There is a combination of multiple profile lines flowing all over the body, making it look well-defined. The side is just as smart as the front with a prominent shoulder line flowing all the way to the tail lights. The new-gen offering is bigger in terms of dimensions, but even then Volkswagen has managed to make the overall packaging look quite compact. The large wheel arches with short overhangs lend a nice touch to the side profile while the 18-inch multi-spoke alloys fit neatly in the wheel well. 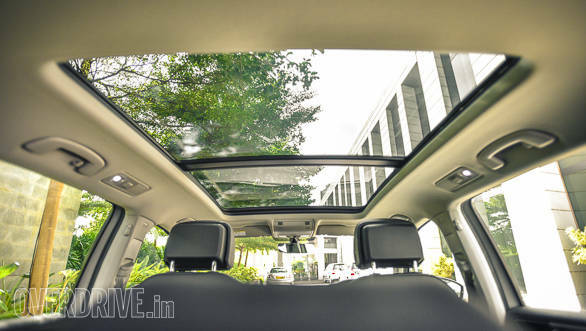 The new Volkswagen Tiguan's brushed aluminium-finished roof rails and chrome garnishing around windows and doors add premium touch while the matte cladding on the lower half of the body lends an air of ruggedness. Move to the back of the car and you'll notice how neatly all the lines from side merge into the rear. The tail has been kept simple, with a clean design and minimal badging, while the sleek LED lights (only available on the Highline trim) ensure that it doesn't look boring. The first thing that you'll notice once you step inside the 2017 Volkswagen Tiguan is the commanding driver's position which allows for proper judgement of the surroundings. However, unlike traditional SUVs, the cabin layout is more car-like. 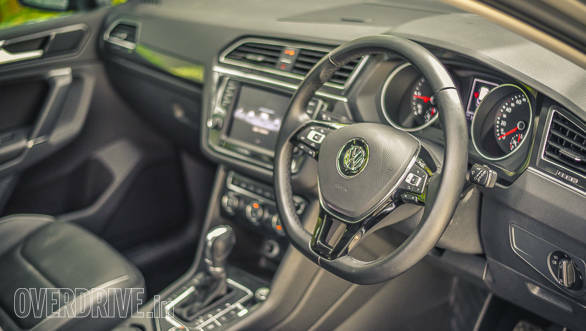 The flat-bottomed leather-wrapped steering wheel, twin-pod instrument cluster and the all-black interior is reminiscent of Volkswagen cars. However, in the Tiguan, the build quality, and the fit and finish are top-notch. The driver-centric dash is a nice touch, and an array of buttons around the central infotainment system aid the driver finding what he's looking for without having to go navigate the UI through the touchscreen. The 12.3-inch infotainment system comes with Android Auto and CarPlay as standard on both trims. However, the navigation system, which could have been useful feature, is not available in the India-spec car. But it does come with an 8-speaker entertainment system that offers impressive audio playback. Moving on, the Volkswagen Tiguan comes with a 3-zone climate control. While the weather in Bangalore was a decent 29°C, the AC unit did a fine job of keeping the cabin cool. Then there is the panoramic sunroof which is the highlight of the cabin. Open it up and the entire cabin becomes brighter and feels roomier. Adding to that, the 2017 Volkswagen Tiguan offers a spacious cabin, possibly more spacious than some of its German rivals. The headroom and shoulder room are impressive and so is the kneeroom at the back seat. The driver's seat comes with a memory function, while both the front seats come with height adjustment. The second row can accommodate three comfortably and can be adjusted a bit for reach and recline. However, the only issue here is that the transmission tunnel and the rear AC vents will probably intrude into the kneeroom of the middle passenger. Also, both seats come draped in quality leather with sufficient cushioning, which will be comfortable on long journeys. In terms of storage space, there is a dashboard-integrated unit for knick-knacks, one below the central front armrest and another below the front passenger seat. Both the front and rear seats get two cupholders while each door can hold a 1-litre bottle. The Tiguan's boot has a 615-litre capacity which expands to 1,655 litres with the rear seat folded down. Internationally, the 2017 Volkswagen Tiguan is offered with multiple powertrains. 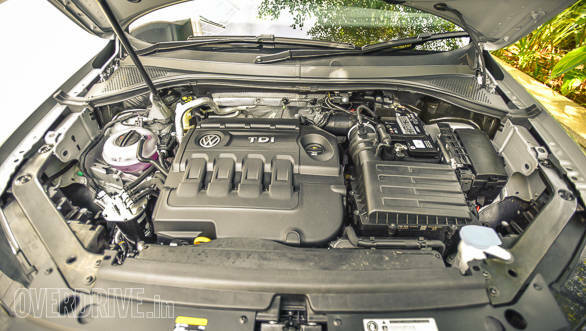 However, Volkswagen will offer just the familiar 143PS/340Nm 2.0-litre TDI in India. It is generally a refined unit but is audible at idle. While driving in the city, we experienced a certain level of lag which reduces gradually as the motor crosses the 2,000rpm mark. In fact, keep the motor revving between 2,000-3,000rpm and there is enough torque to play with. 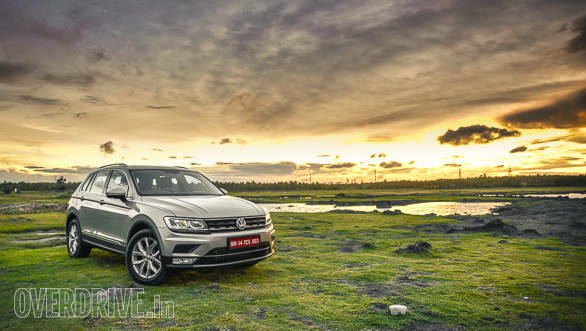 The Tiguan is at its comfort zone on highways where the motor can easily hold on to higher speeds effortlessly. 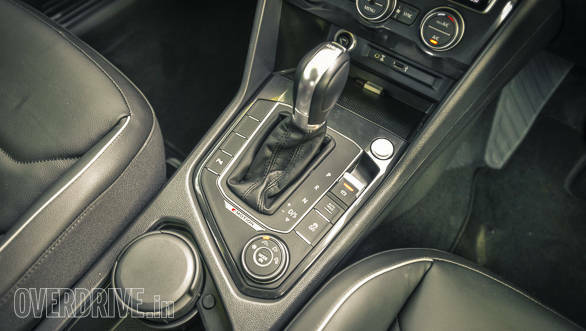 The engine comes with a 7-speed DSG unit which, as always with VW DSGs, offers buttery smooth gear changes. While it shifts up quickly, there is a bit of lag when it comes downshifting for quick overtakes even in Sport mode. Additionally, there isn't too much engine braking either because the transmission doesn't downshift very aggressively as you slow down. However, the use of paddle shifters solves both these problems. Just behind the DSG stick is the rotary control to select the different drive modes  Normal, Off-road, Off-road Individual and Snow. 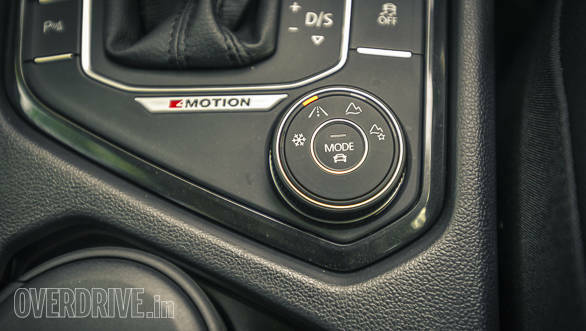 These modes alter steering feel, powertrain behaviour and air conditioning of the vehicle. In Normal mode, there is an option to individually change these settings. In the Off-road Individual mode, one can also alter the drivetrain and hill hold/descent settings. The Volkswagen Tiguan is based on the MQB platform and this has made it lighter by 60kg than its predecessor, despite the larger dimensions and additional electronics. The suspension set-up offers a soft ride, as it effortlessly irons out uneven undulations. While driving it over certain rough roads, the cabin was completely isolated from disturbances which also highlight the impressive NVH levels of the cabin. Like I said, it is on the highway that the Tiguan truly belongs. The straight-line stability is impressive and so is the confidence that the Tiguan invokes around corners. There is almost negligible body roll, which we believe is because of the lower ride height paired with the Hankook tyres. Adding to that are the brakes which offer enough bite, bringing the vehicle to a standstill without any drama. While road behaviour is quite impressive, we were unable to test its off-road capability. 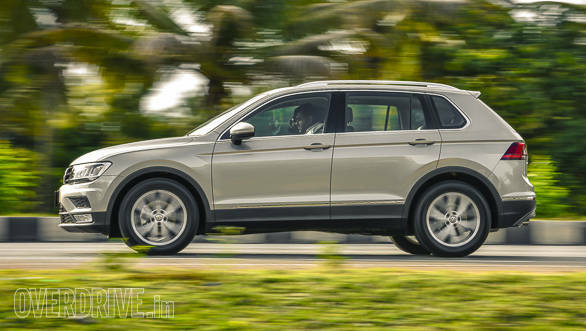 However, if you are looking for hard-core luxury off-roader, there are other options you might want to consider as the Volkswagen Tiguan has a ground clearance of 149mm. In comparison, the Ford Endeavour and the Toyota Fortuner have a ground clearance of 225mm. An aspect where the Volkswagen Tiguan scores well is in safety. The SUV comes with six airbags as standard and apart from self-sealing tyres and a reverse parking camera which are offered only in the Highline trim, the list of safety features is identical in both variants. Some of them include Isofix child-seat mounts, parking sensors, ABS, stability control, height-adjustable front seat belts with pretensioners and a tyre pressure monitoring system. The most important feature is the active hood which has been designed keeping pedestrian safety in mind. In case of a collision, there is a sensor in the front bumper that raises the rear end of the hood to minimise the injuries caused to a pedestrian. What's worth mentioning is that the Volkswagen Tiguan has been awarded five-star safety rating by the EuroNCAP. 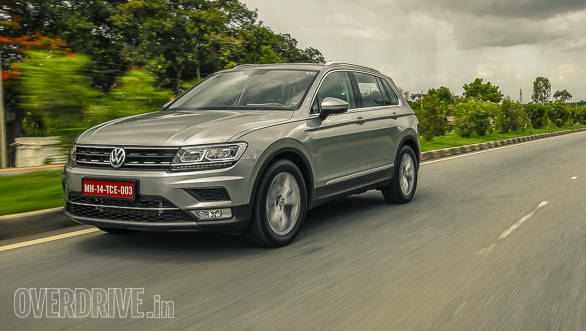 At Rs 27.68 lakh, the Volkswagen Tiguan is certainly an expensive option when compared to the Hyundai Tucson and even the Ford Endeavour. 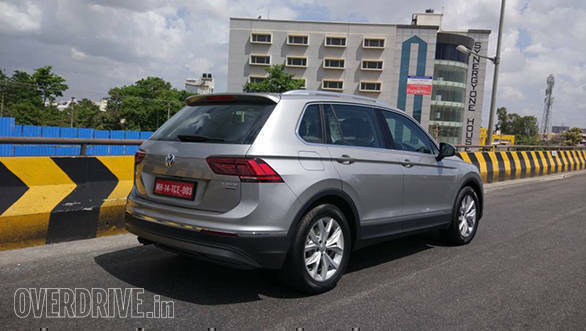 But the Tiguan is a niche offering that will appeal only to those who want a premium yet distinct SUV which, at the same time, is more practical than the other luxury cars it competes with. It is admittedly quite expensive but at the same time is a well-designed package which offers luxury, safety and decent practicality.